The importance of looking after the families of soldiers serving on operations was the focus of a recent visit to Colchester Garrison by the Minister for the Armed Forces Nick Harvey. With soldiers from the town’s 16 Air Assault Brigade returning imminently from an arduous six-month tour of Afghanistan, Mr Harvey met with soldiers’ families to talk about the demands placed on those that are left behind. Mr Harvey was given a tour of the Army Welfare Service’s Community Centre in Fallowfield Road and was briefed by staff and unit welfare officers on how families have been looked after during the tour. This is a well-equipped and modern facility providing exactly the right welfare services that families deserve to be given when their loved ones are away on operations. I congratulate all the welfare staff for the scale of effort and thought they have put in during 16 Air Assault Brigade’s tour to provide support to families. Mr Harvey also saw the construction site for the new Personnel Recovery Centre (PRC), the first purpose-built facility to give wounded, injured or sick soldiers additional care and support to help them successfully return to duties or transition into civilian life. 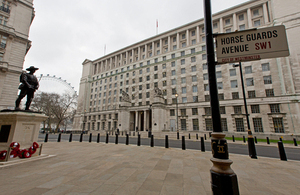 The capital costs have been met by Help for Heroes, while the Royal British Legion will meet the centre’s running costs. When complete, the PRC will provide individually tailored support to help our soldiers complete their recovery from injury and get back on track with their lives. I look forward to it opening and being able to help our personnel, and thank our charity partners for helping us to achieve this in financially difficult times. It was a pleasure to host Mr Harvey. We hope that he has gone away better informed about Colchester Garrison and reassured about the excellent welfare support provided to families during 16 Air Assault Brigade’s current deployment to Afghanistan.